Racing may have left the franchise, but bald heads never will. With Letty (Michelle Rodriguez) finally remembering everything, she and husband Dominic Toretto (Vin Diesel) are spending some much needed R&R time in Cuba, thinking about what the future holds for them in making a family of their own. It would appear that the Dom certainly doesn’t miss the bullets like Brian once did. Unfortunately, the bullets and high-risk scenarios always seem to find him; this time, via an enigmatic woman known as “Cipher” (Charlize Theron). Cipher, having secret information on Toretto that puts who he loves at risk, forces him to carry out her dangerous plans by using his own team/family to capture a world-altering device…only to take it from them and deliver it into her hands. Being crossed, Agent Hobbs (Dwayne Johnson), Letty, Tej (Chris “Ludacris” Bridges), Ramsey (Nathalie Emmanuel), and Roman (Tyrese Gibson) are left to pick up the pieces. And that means going after Dom and figuring out why, with an uneasy ally in Deckard Shaw (Jason Statham) added into the fray. 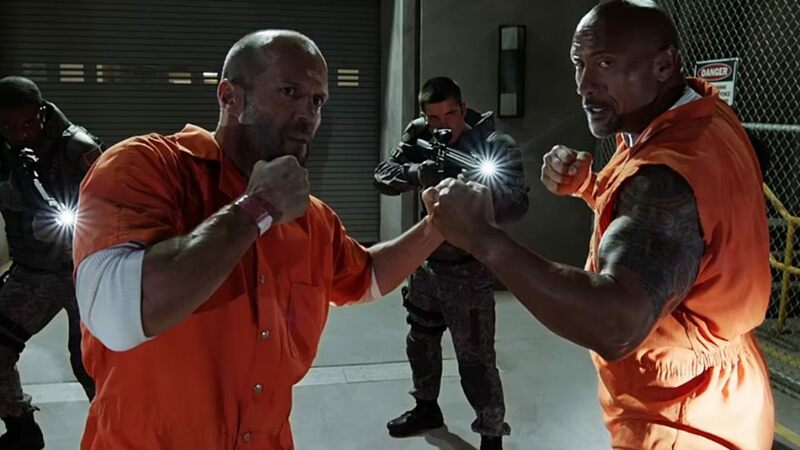 If Fast Five was Universal doing Marvel’s The Avengers before that movie happened, the latest in the F&F universe, The Fate of the Furious, feels a little like Captain America: Civil War, or The Avengers 3 or whatever. How so? It manages to bring back almost everyone of note while introducing new characters that are sure to play roles in future offerings, and flips the script a little in making a central character a major antagonist. 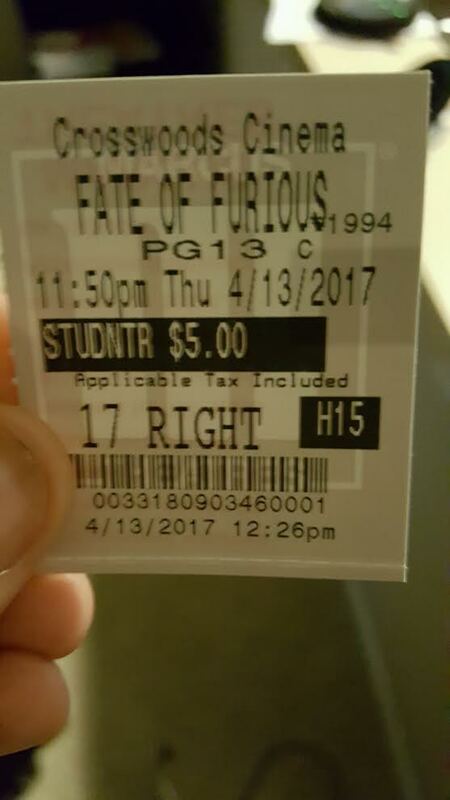 It definitely lacks the emotional aspect of Furious 7, as well as and the large stakes, character moments, and insane thrill ride that was Fast Five. But, “F8,” though skidding more on the road than past predecessors, doesn’t completely wreck itself. At eight films deep, the Fast and Furious universe has lore. Lots of it, and the eighth installment uses every inch of trunk space it has to accommodate it. In other words, it has continuity…in a way. Thought God’s Eye was just a MacGuffin to never be seen or referred to again? Put to actual good use here! Believed Elena would just slip into the background? Think again. Everyone knows how ridiculous this franchise can be, proudly wearing that ridiculousness as a badge of honor. But credit to where it’s due; writer Chris Morgan continues to draw up new scenarios that give mileage to the universe. Don’t mistake that praise as complete support for The Fate of the Furious‘ script. It does enough to get by (a poor man’s version of Civil War, even with a bit of The Winter Soldier), with a familiar theme and intriguing reveal. But for some reason, its story holes and matters unexplained actually make one think about them more in a logical way. That’s not supposed to happen with a F&F movie! And as stated before, the continuity generally works, but the end scene (as well as a few others) does betray much of what the prior movie(s) established in the way of character relationships, making it hard to accept that some sins in this world are somehow forgivable. Director F. Gary Gray (Straight Outta Compton, Friday) makes the third new different director in the last three Fast and Furious movies to helm the film’s physics-defying action. Having some experience in action with The Italian Job, Gray, like Wan, mostly impresses. It’s hard not to be impressed with the massive set pieces, in large part done practically. CGI gets a little iffy at times for such a big budget production. Like Wan, however, Gray comes up short compared to Lin on a hand-to-hand combat level. Not quite shaky cam, but the angles used can sometimes be disorienting. Still, he makes a case to direct the next one if need be. Perhaps Vin should give directing a shot, with the amount of power he seems to be wielding as of late. Performance-wise, Diesel simultaneously serves up a surprising job in spots, as well as an unintentionally funny one, often in the same scenes. Unfortunately, Paul Walker is missed, not necessarily in the action scenes where he more than held his own, but in the slower scenes. He brought an everyman presence that is lacking here, especially as the lengthy movie grinds to a halt in spots. The real news coming into F8 was the legit beef between Diesel and Dwayne “The Rock” Johnson, with rumors being that Vin wasn’t happy with Dwayne stealing some franchise thunder. After seeing F8, I can see why. Johnson is the clear star of this series now, bringing his trademark energy, dead-eye one-liners, and larger-than-life persona to the Hobbs character. Jason Statham eclipses Vin as well, his dry and rugged Deckard meshing well with Hobbs and generating interest in a future teamup. Out of the newcomers, Charlize Theron is the most menacing villain the franchise has ever had, if only her Cipher wasn’t as vague in her motivations. Scott Eastwood and Helen Mirren add name value, little else, but they’re fun enough. Returnees Ludacris, Tyrese, Michelle Rodriguez, and Kurt Russell get little spots to shine, though ultimately take backseats to Johnson, Diesel, Statham, and Theron. If the Furious series is a mile represented by 10 movies at 1/10th of a mile each, it’s not inconceivable to think it hit top speed a few movies ago, and is decelerating as it approaches the purported finish line. One thing’s for certain, though. There’s no stopping before that line comes, and every drop of gas will be used before it comes. Photo credits go to irishexaminer.com, birthmoviesdeath.com, and moviepilot.com. C+? Noooooo!! A+ surely! Ha ha. I definitely believe these have peaked. Some solid fun, but franchise fatigue, for me at least, is setting in.